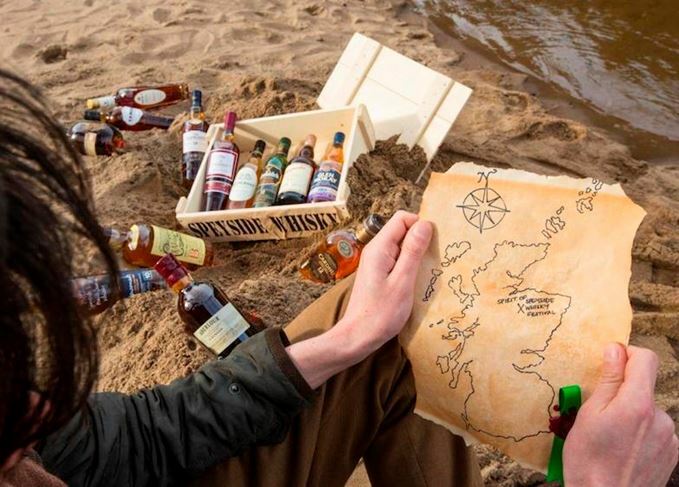 Visitors to this year’s Spirit of Speyside Whisky Festival can embark on a high-tech treasure hunt, seeking out secret stashes of Scotch whisky in a new take on the geocaching craze. During the five-day whisky celebration, held from 27 April to 1 May, visitors will be able to follow a trail of three caches of whisky left by Angels’ Nectar Blended Malt Scotch Whisky, using clues supplied by the organisers. Each location will hold an initial 200ml bottle, with whisky cachers asked to replace the bottle they take with a miniature of their own, to be discovered and enjoyed by the next cacher. Festival chairman James Campbell said the venture could be the first dedicated whisky cache trail in the UK, adding: ‘There’s huge interest in geocaching and we expect the same to be true for whisky caching, which is being offered for the first time this year. Often described as a high-tech treasure hunt, geocaching involves participants using a GPS device and other navigational techniques to discover concealed containers called caches, containing a logbook and pen or pencil. The Speyside version does not require GPS – clues will be issued on registration – but, given the terrain and unpredictable weather, outdoor footwear and sensible clothing are advised. Participation is free, with whisky caching available throughout the festival. Tickets can be reserved on the Spirit of Speyside website. Whisky caching is one of almost 500 events on offer at this year’s Spirit of Speyside, including distillery tours and tastings, heritage walks, whisky and food pairings, river canoe trips, ceilidhs and craft workshops. Festival-goers will again hunt for hidden caches of whisky across Speyside this May.